A crucial yet often overlooked component of landscape design is the implementation of paths and walkways. In professional, public, and home garden settings, a landscape that incorporates a fitting path will rise to the next level of aesthetic beauty and practical functionality. At Everlast Services, we specialise in a wide range of walkway options. The wide array of available materials, together with the high degree of malleability means that whatever your vision, we can implement the right solution. There’s a lot to consider when it comes to choosing the right path. It’s got to look and feel right, but must also meet traffic demands and functional use. Is it best to have formal paths, characterised by straight lines and right angles, or informal paths, characterised by meandering, curved design? The answer will depend on the context of your garden and lifestyle. At the end of the day, your options are near unlimited, and we haven’t even begun to talk about design. From simple paths with mixed materials, to an exotic, rustic, mixed pathway. 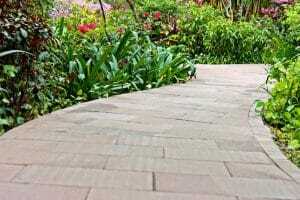 Perhaps you’re after a cottage garden path with gravel and stepping-stones, or the functional reliability of concrete. There’s Asian-Style walkways and curving stones, contrasting squares that play with interesting shapes, inlay bricks, paving-stones, and much, much more. We think there are a bunch of excellent reasons to go with Everlast. So here’s why. When you choose a landscape contractor, it really helps to work with the right mixture of experience, flexibility, and communication. We’ve provided creative and affordable landscape contracting for Victorian households for over 20 years. We’re proudly Australian owned, and always work with a passionate commitment to fulfilling your vision through dedication and open communication. Our mission at Everlast is to offer top quality workmanship and material at an affordable price. And these aren’t just words! We can pledge this because we’re uniquely positioned in the Victorian market. We own our own manufacturing plant in Hoppers Crossing, Melbourne—so we have no need for a middle man to supply many of our materials. Coupled with our experience and expertise, we’re confident in our professional edge.